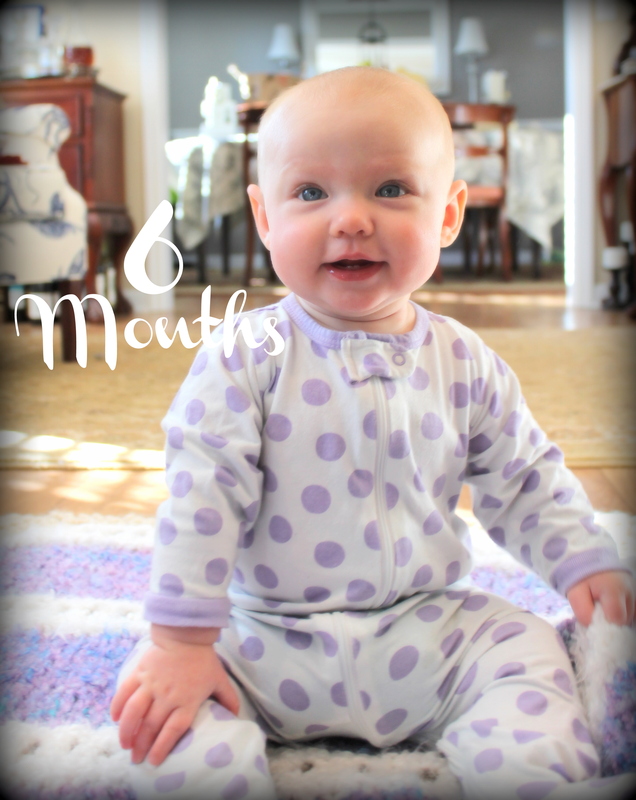 Hazel is six months old! Her development has really taken off in the last month. She has gained much greater control over her movements, and can roll with greater purpose. 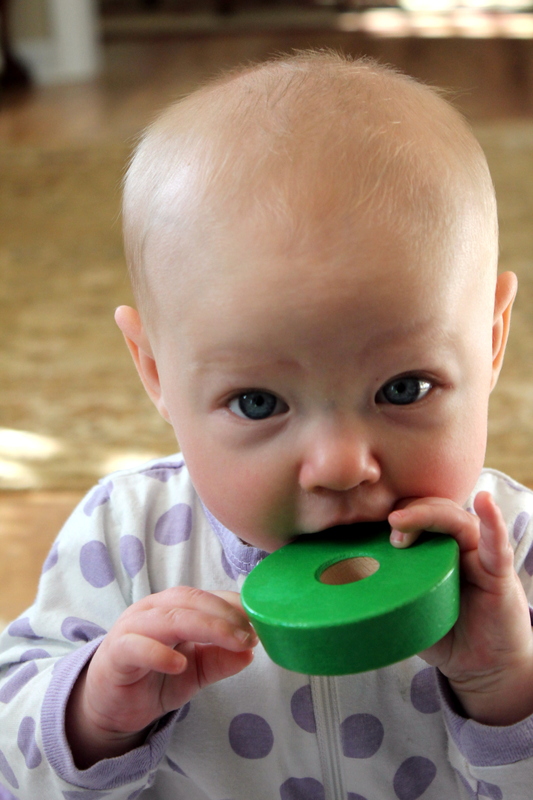 She sits up unassisted, and can grasp and manipulate objects with increased accuracy. Translation – she no longer hits herself in the face with things every single time. We introduced rice cereal, which was a disaster, and quickly switched to oat cereal. I grind regular oats in my coffee grinder, and then cook enough for several days. Yesterday was the first day that eating really clicked with her. It was like she finally realized that we were not playing some messy game. Hazel’s first vegetable will be a sweet potato on Thanksgiving Day. Her favorite activity is making out with the dogs. Ew. Hazel’s hair is finally starting to grow in, and her fuzzy head is adorable. Pinkies up! She’s so fancy. I make (what feels like) a million decisions a day. But some decisions cause me great and continuing agony, for no apparent reason. I think it has to do with scope. I am very good at deciding between two or three options. I am terrrrrrrible at deciding when the options are basically unlimited. When we chose paint colors for the house, I went neutral in all the living spaces (because, again, DECISIONS ARE SCARY). But I had the dining room painted gray – that was all the color excitement I could handle at that moment. I could not wait to put up curtains and recover the seats of the chairs so that we had a stylish room in which to eat. Three. Years. Went. By. Three years! What color did I want to use with the gray? Coral? Turquoise? Yellow? More gray and white? Plum? Teal? I had no idea in what direction I wanted to go, and it was paralyzing. We have a lot of antique furniture in that room, but we also use it for family dinner every night. It’s a very hardworking space. Pinterest was absolutely no help whatsoever. Every time I’d make up my mind, I’d see another BRILLIANT idea that I just had to copy. And every night we’d sit down to dinner and I’d look at the bare walls and mismatched chairs and sigh. 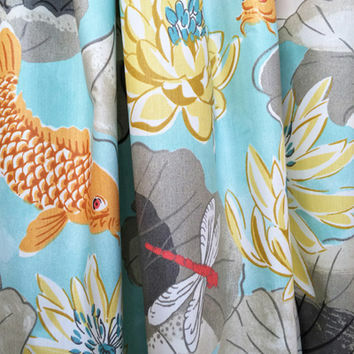 So the next weekend I bit the bullet, went to the fabric store (the same store where I procured the fabric for the octopus chairs) and made a decision on curtain fabric. Surprising no one, it involved marine life. It’s “Lotus Lake” by Waverly. Because I spent a lot on the curtain fabric (where “a lot” = “a lot for me”), I needed to go cheap on everything else. To line the drapery panels, I bought a 9′ x 12′ drop cloth at Home Depot for around $20. I got a dowel rod, brackets, finials, and curtain ring clips at Lowes for just under $40, and painted them white with leftover spray paint. And then I broke my d@mn sewing machine. 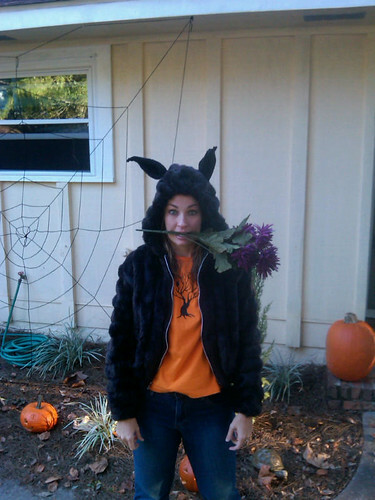 I love Halloween. It seems to be the one holiday where one’s creativity can truly be unleashed in any direction. 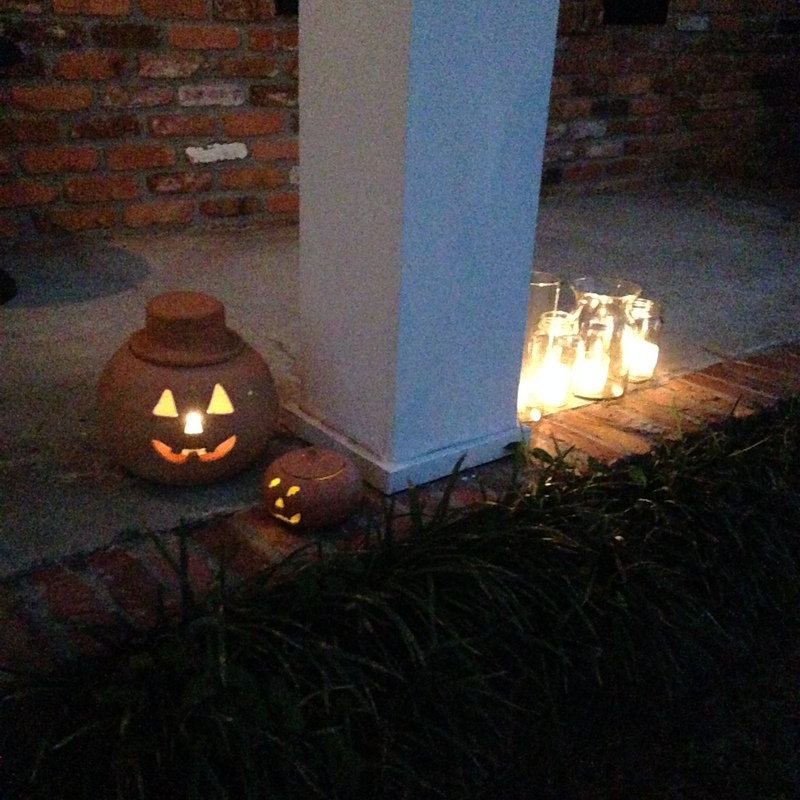 Halloween can be anything to anyone – cute, clever, creepy, funny, or spine-tingling. I mean, there aren’t many ways to make Easter hilarious. Or make Thanksgiving witty. As a matter of fact, we haven’t been home for Halloween since we moved to this house in 2011. 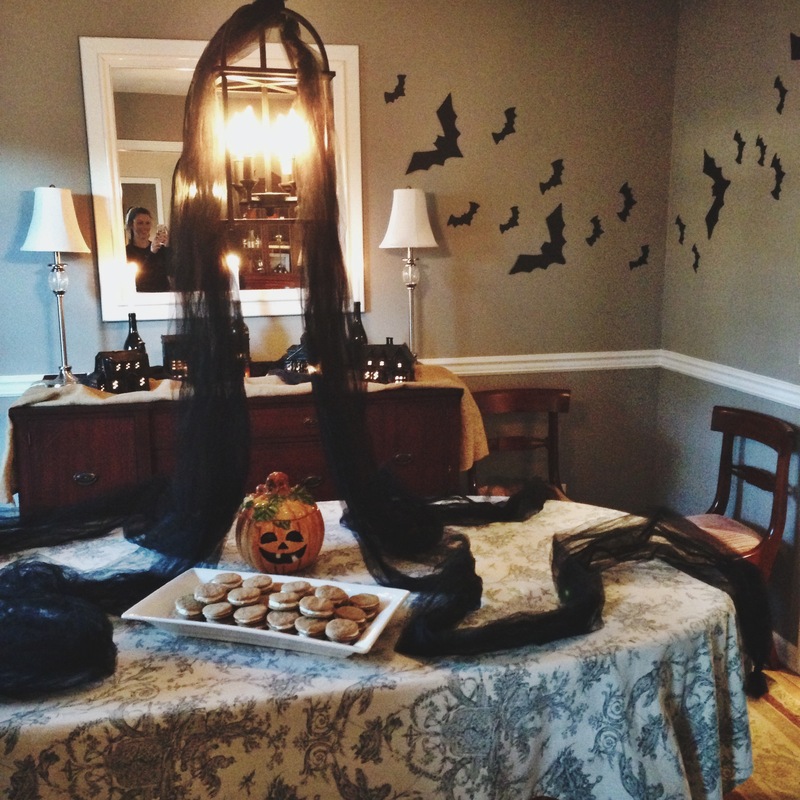 This year, we decided to host a grown-up Halloween party, since we didn’t have any of our kids. 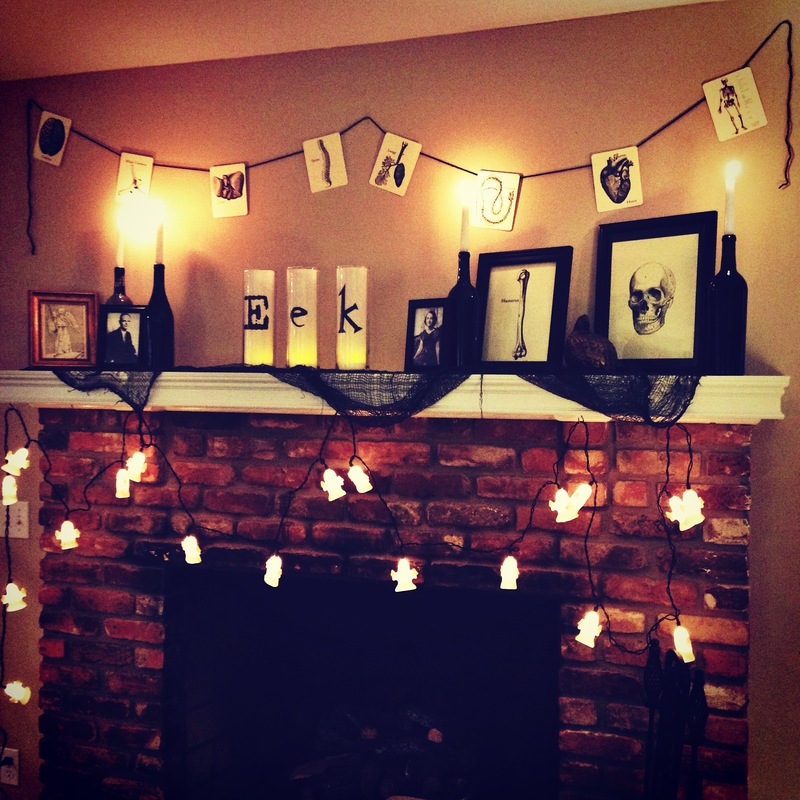 And I decided to get off my buns and decorate. 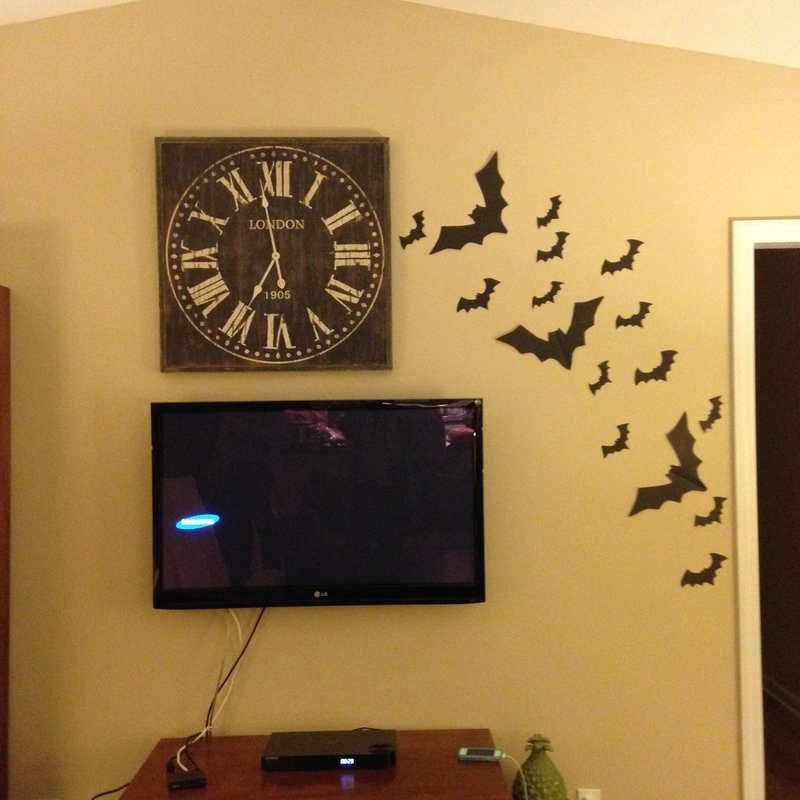 I focused on a few areas, rather than trying to spookify every square inch of my house. I also didn’t want anything cutesy or glittery, because I have a shriveled little grinch heart. I wanted bats. 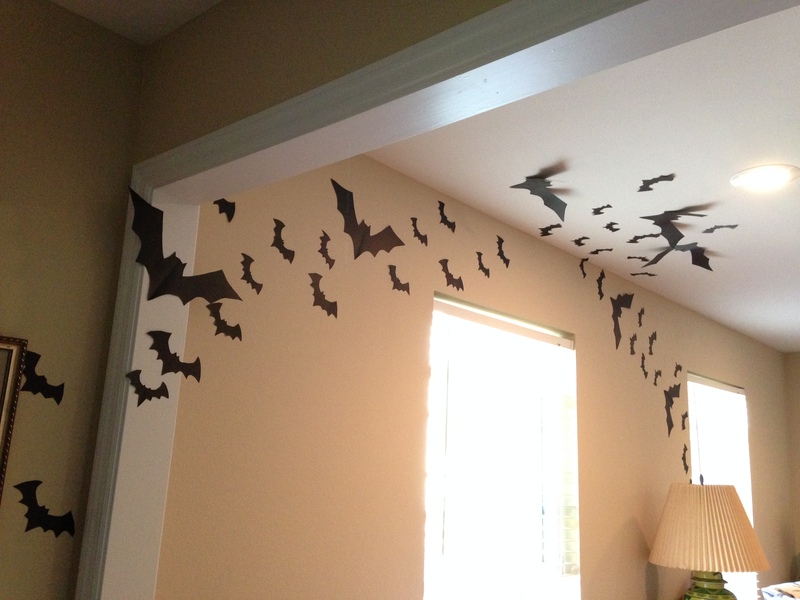 Specifically, these bats. I wanted a flock of them to careen around my house. I deputized Jason, Hollyn, and Jensen to make my bat dreams a reality. And behold, it was batty. 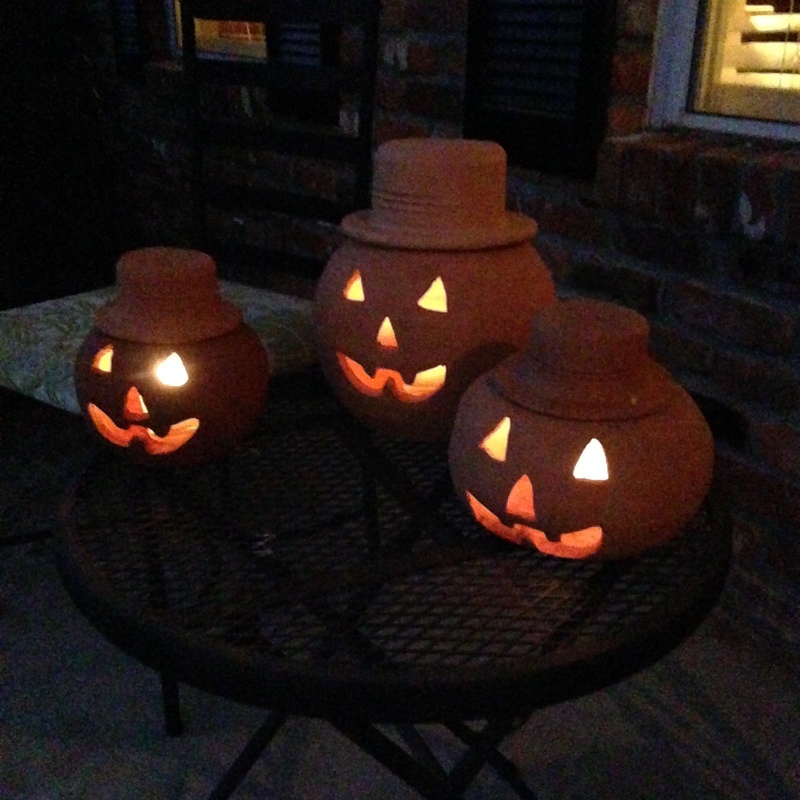 These terra-cotta pumpkins belonged to my parents. Since my mother no longer decorates for any holidays, she let me have them. They guarded the front door. I also set out some of my random glass vessels (roasted red pepper jars, vases from our wedding, spaghetti sauce jars) and put candles in them, too. 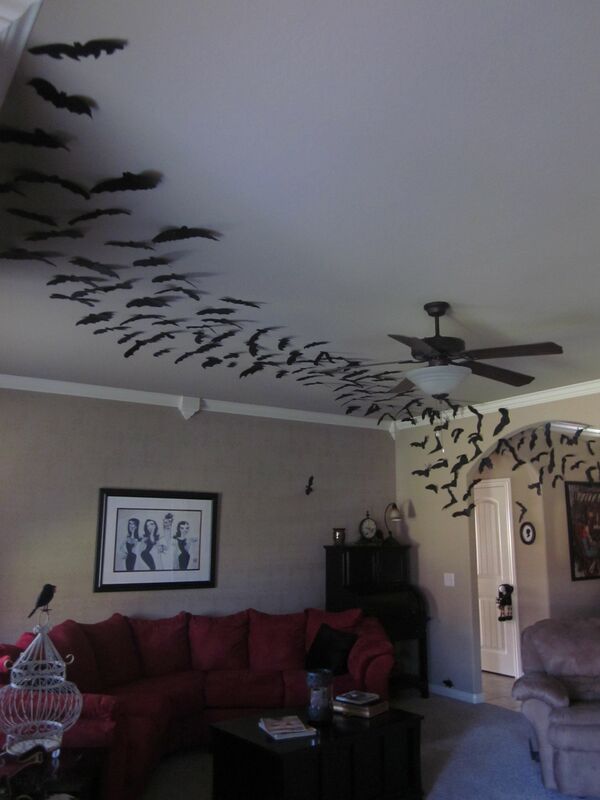 Yes, there were MOAR BATS in the dining room. 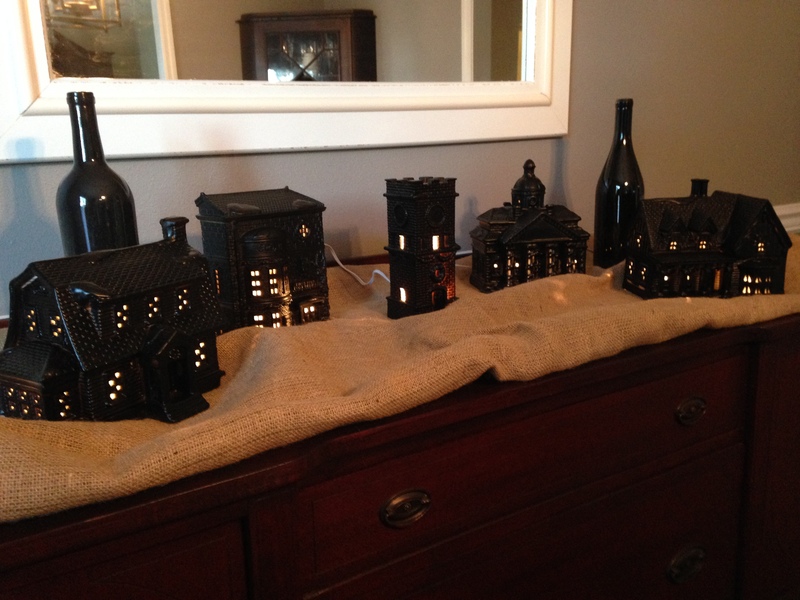 And on the sideboard is my Zombie Village, which started out life as a Christmas Village that was scorched in our house fire. A few coats of black spray paint later, it was ready for Halloween. The ghost lights were borrowed from a friend. I bought the drapey cloth stuff from the dollar store. I printed a few pictures from Clip Art Etc. and stuck them in frames I already had. I printed the “Eek” letters on sheets of vellum, and put them in vases with LED tea lights. I collected wine bottles (and by “collected” I mean “emptied into my mouth”) and painted them black. The creepy vintage photographs? Those are my actual grandparents. 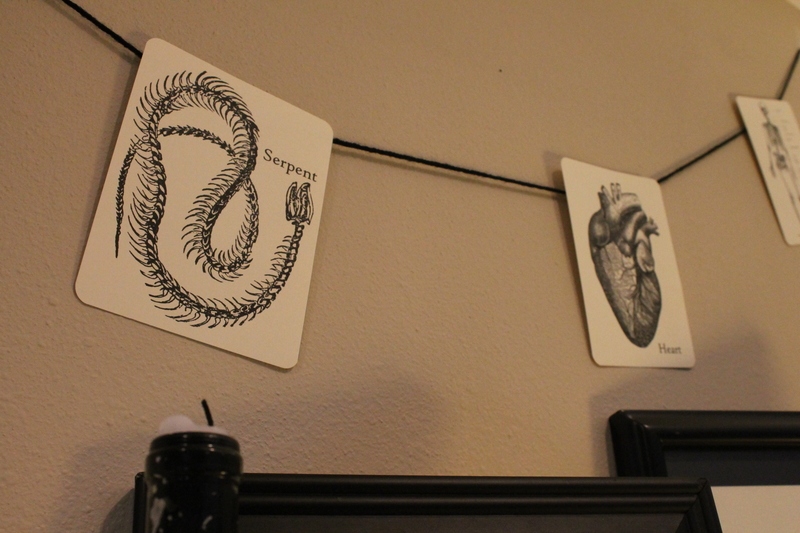 The anatomy flash cards were probably my favorite project. I got the idea here, and they turned out perfectly. $5 – five packages of creepy cloth from the dollar store, used in foyer, living room, dining room, and family room. Everything else was free, borrowed, or already in my crafty arsenal. So that’s it! Halloween on the cheap. I hope yours was filled with loads of good candy and zero wax lips.